It belongs to the tarantula and is found in the region of Northern South America. It is the world’s largest spider in terms of mass and size. But it is second to giant Huntsman spider by leg span. It generally preys on small birds. Unlike other spiders, females do not eat males during mating. Females in 3 to 5 years and live for 15 to 25 years. Males die just after maturity and live only for 3 to 6 years. Their body colour varies from dark to light brown with faint marks on the body. Female lay eggs from 100 to 200 at a time in the burrows made by them. In threatening conditions, the Goliath birdeater rub their abdomen with hind legs and release hairs which irritate the skin of the opponent. During the day, they live in burrows and comes out in the night to hunt. Because of poor eyesight, they detect its prey with the help of vibrations on the ground and then pounce on the prey and inject venom with the help of their fangs. They are large and one of the biggest spiders in the world, however, their most common defence is to run their back legs against their tummy which flicks tiny, sharp hairs into the air. Despite their name, they don’t eat birds but love to eat lizards, frogs and small mammals. They are large long-legged spider measuring up to 15 cm across the legs. These spiders have eight eyes. They are mostly grey to brown with black coloured markings on their body. Though their vision is not Good as compared to other spiders and they could only see approaching objects which are at a closer distance to them. Huntsman spiders do not build webs instead they hunt for food. They are also called wood spiders because they prefer a woody place to live. They live in logs, a loose branch of trees and rock walls. These spiders are notorious and sometimes enter the house and in cars. Female spiders lay up to 200 eggs at one time and guard it for 3 weeks. Generally, Huntsman spider does not come under the category of danger spider. It is one of the biggest spiders in the world. It is mostly seen in the tree trunks, under bark, beneath stones or on the walls of houses and some of the species live between the hairline cracks of sandstone and granite outcrops. The species love to eat insects, arthropods, small lizards and frogs. The fangs of the species are large enough to hold the food item until it has been immobilised by the spider’s venom. The spider bites can be painful to humans and can cause mild nausea and headaches. The species is believed to be the world’s third largest species of tarantula. It is a fast-growing species and spends most of their times outside playing an adult. They are uniform black coloured and once mature they have pink hair all over the body. Mature mails have tibial hooks on the front pair of legs. This hook back’s a female leg during mating. When In threatening conditions, tarantula raises its front leg and try to stop its enemy. If the attacker doesn’t stop here tarantula tries to bite. It is said that tarantula prefers biting in the last situations, else it makes use of urticating hair which if thrown in eyes causes blindness. During breeding season, males drop their sperm onto the female webbed mat. Brazilian salmon pink are very popular in captivity due to their size and appearances. One of the largest tarantulas in the world can grow upto diameter of six inches during the first year of his life. Talking about the appearance, the species is pink coloured with long salmon-coloured hairs sticking out from their legs, mouthparts and abdomens. The colouration is one of the best and unique way to identify these tarantulas. Also, as the name suggests it not like that they will at only birds, sometimes they attack small birds, however, most of the time they love to eat insects, lizards, frogs and mice. This species is famous with common name Indian ornamental tree spider found in the Easter and western ghats of Indian Subcontinent. They are elongated species with legs reaching 18 cm in males and 22 cm in females. They are grey coloured spiders with a wonderful complex of black and white stripes and chevron. They show yellow bright spots of colour at the 1st pair of legs at warning time. They usually prefer to feed small flying insects, cockroaches and even a small mouse. The species have venom that has medicinal uses. One of the largest spiders in the world, Sun spider also famous with names camel spiders, wind scorpions, or solifuges. The largest species grow up to 5-6 inches. It belongs to solifugae an order of animal in the class Arachnida. The largest species can reach up to 12 to 15 cm in length including legs. Many urban legends have stated from their experience that size, ability and potential danger to human from Solifugae are negligible. The body of Solifugae has two tagmata – an opisthosoma and prosoma. Despite their common name they are neither categorised as spider nor scorpions. Solifugae have five legs but only four hind legs are true legs and each leg have seven segments. Solifugae have eversible adhesive organ and they use it to prey flying insects. Talking about the appearance, sun spider is tan, brown or reddish brown in colour with a hairy body. They are equipped with elongated jaws known as chelicerae and have 4 pairs of long legs with one pair of leg-like sensory organs known as pedipalps exist near the jaw. Additionally known as “wind scorpion” because of the scorpion-like body and its ability to run like a wind. The lifespan of the spider is two years in the wild. Related: New Species Of Marine Spider Emerges At Low Tide Named After Bob Marley. King baboon spider is found in the east African countries like Tanzania and Kenya. King baboon is borrowing spider which lives in burrows they made on grasslands. These spiders have venom which they use to kill their prey. They feed on insects, lizards, cockroaches, birds and can even kill mice. Unlike other spiders they don’t have urticating hairs then also they can be very defensive. They are slow growing spiders that grow up to 20 cm in leg span. It is the only species from the genus pelinobius. Spider ranges its colour from rusty brown to orange coloured. King Baboon spiders are preyed upon by birds, baboon and other mammals. Adult spiders can be kept in the aquarium which should contain 10-20 Gallons of water, a hidden area and shallow water dish should also be provided. They are mostly seen in residing in the burrows in the ground with silk at the entrance to detect the vibrations of the passing prey. During the day they hide in the burrows and usually hunt in the night. They love to kill and eat beetles, cockroaches, spiders and even mice, lizards, small snakes and birds with the help of their powerful fangs to deliver a nasty bite. These spiders are quite common and seen in the grasslands of Kenya, Uganda and Tanzania. The tarantula can found in the regions across the earth. 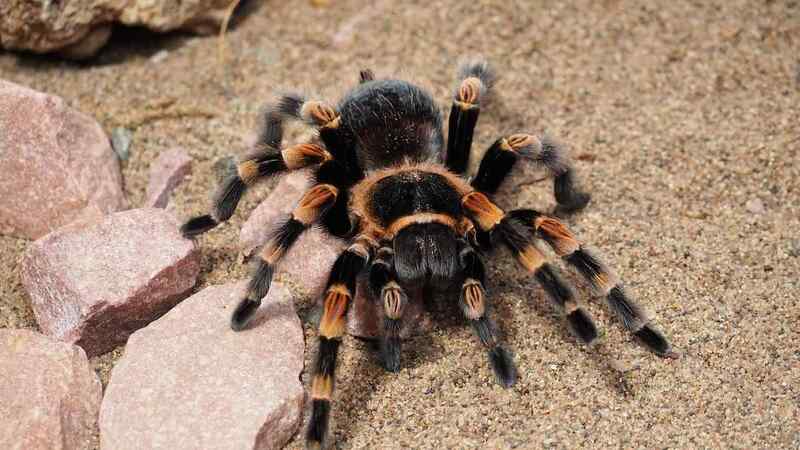 Tarantulakept as pets has urticating hairs that can cause irritation to skin and can damage eyes. Tarantula has a long life of 15 to 25 years. It is an invertebrate that relies on an exoskeleton for muscular support. Tarantula size varies from the size of fingernails to as large as a dinner plate. The largest species of tarantula weighs 85 gram and the largest of all Goliath eater in Brazil weighs 170 gram. Tarantula is becoming famous pets. Tarantula is borrowers that live on the ground. Their natural habitats include savanna, grasslands such as rainforest, deserts, scrubland and cloud forests. Almost all tarantulas are hairy in appearance and have 8 legs and 2 fangs. Despite 8 eyes, they don’t have a good vision and mostly depend on the vibration to detect its prey. They love to eat insects, small lizards and even birds, however, they have a lot of enemies like Snakes, lizards, birds, coyote, and foxes. The species produces silk to mark its area, protect its eggs and hide in nests. The spider has a lifespan of 5-10 years, however, females can live upto 20 years. One of the scariest spiders, Brazillian wandering is mainly found in the regions of North America and Central America. Phoneturia is a genus of venomous spiders. The genus as a whole is sometimes called a Brazilian wandering spider because they wander in the night at jungles rather than waiting for the victim at their web. Phoneturia is also famous with names like Armed spider and banana spider. The spider in this genus can grow up to a leg span of 12 to 15 cm. To defend themselves they use to raise front two legs and characteristics Colour pattern of their body tells they are in danger. Besides the pain in their venomous bite, it also causes priapism in humans. The spiders are vest recognized because they stand on the back legs while lifting its front legs. One of the most poisonous animals doesn’t hesitate to attack humans if provoked. They are mostly seen under the rocks during the daytime and love to hunt in the night. They are mostly seen in the highly populated areas of Sao Paulo, Rio de Janeiro, and Espirito Sanito. These are medium-sized spiders native to tropical South America. These spiders come in brown colour with pinkish or orangish-red hairs. They are regarded as beginning species from tarantula family. The Chilean Rose tarantula is a common pet due to its obedient behaviour and its venom being mild. They try to keep themselves dry because they hate being getting dried. It feeds on small invertebrate insects. They are mostly seen in the desert and scrub regions of Northern Chile, Bolivia, and Argentina and loves to hunt in the night. They love to eat grasshoppers, crickets, moths, beetles, cockroaches and mealworms and sometimes also grab the pinky mouse. The best food for the pets tarantulas are crickets that will be the best source of hydrated nutrition for the tarantula. A species which belongs to Huntsman spider and can be found in Israel and Jordan. Spider has a leg span of 14 cm which is the largest member of sparaissade In middle East Asia and hence listed as one of the largest spiders in the world. Female are generally bigger in size than males. Males have a body length of 1.85 cm to 2.40 cm while females have a body length of 2.20 cm to 2.65 cm. At night and in hotter summers it is a more active spider. It constructs underground dens with trap-like door and put sand and glue over it in order to make the door disguise from predators. These are the biggest spiders in the world. Do post your comments.